Improv appliqué Valentines Day gifts. Using scraps from bigger projects has always been one of my favorite ways to come up with new project ideas for smaller gifts. 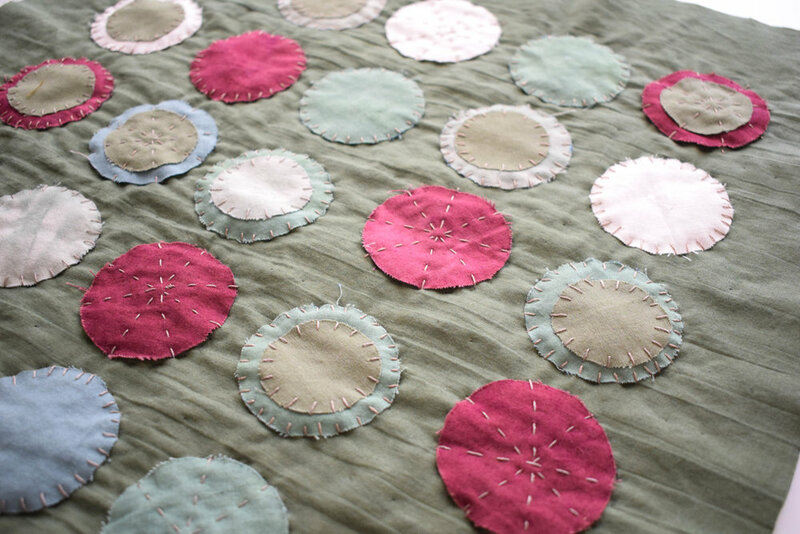 It’s a great way to do some experimenting with an idea you might have been tossing around but didn’t want to cut into that brand new yardage without being sure. I keep all my scraps, regardless of how small, in seperate tubs in my studio separated by scrap size. This is helpful because most projects will use a similarly sized scrap to create cohesion throughout the project. In the past, I have mostly used strips to create fun scrap projects. In fact, my Prismatic pillows began as a scrappy experiment. Every couple months, after I finish a big project or want to get those creative ideas flowing, I pull out the scrap buckets and start messing around. This time, I wanted to do something really different. Since I so often use strips, squares, and rectangular scrap pieces, I was determined that I would challenge myself to (literally) think outside the box this go-around. And what is less box-like than circles?! I also usually make my scrappy projects using improv piecing for my technique, but this time I wanted to do some improv appliqué (because why not). With that in mind, I just needed to figure out what color combos I wanted to use and what size circles I could get out of my scraps. Before starting my project I knew I didn’t have enough materials or time to make anything too big or complicated so I had already decided to make two 16" x 16" quilted pillows for my two (very lucky if I do say so myself) Valentines. Though my scrap bin has project left overs of all sizes, similar colors tend to be about the same size since they were mostly selvedges from the same project. This made determining the circle size quite easy! Once I chose a palette, I just picked the largest circle that would fit on each strip and made as many circles as I could in that color. I used an air erasable pen make my markings on my scrap fabric. If I didn't cut them out soon after I drew them, the air was already erasing my circles! Not knowing what kind of design I would ultimately create, I went to town cutting as many circles out of my strips of scrap fabric as I could and stacking them by color. I really enjoy working this way, first collecting colors and supplies, then creating stacks of shapes (also called restraint shapes, check out my improv tutorial 'No Rulers, No Rules: A Guide to Creating Cohesive Improv Quilts Without a Plan' in the SMT Creative Resources Library for more info on these) and working within these parameters to create something new. I find that my best ideas come from these experiments. 'Desert Sunset' color palette for my second pillow. 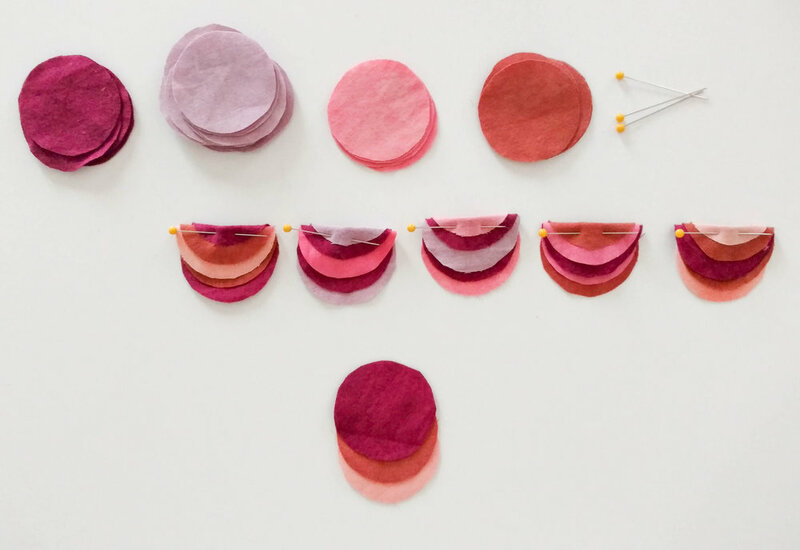 With all of my circles cut out and stacked in front of me, I first separated the different color combinations I wanted to use for each project. For the first pillow I settled on a purple and green combination and for the second, I went with a 'Desert Sunset' tonal pairing of purply maroons and clay colored pinks and oranges. Next, I chose a background color, green for my first pillow and white for the second, and cut a 17" x 17" fabric square for each (the base of my appliqué design). With my different colored circle combos and base fabric, I started to play! For me this is the truely fun part of the improv process. Arranging and rearranging different options until you see 'it': the perfect design. If you are familiar with my 'No Rulers, No Rules: A Guide to Creating Cohesive Improv Quilts Without a Plan' approach to improv quilting, you will know that I like to use repetition in my improv projects because it helps to make an unplanned project look cohesive in the end. With that in mind, I experimented with all kinds of repeating patterns with my circles. I finally settled on a repeating two stack circle pattern for my green and purple pillow, placing single circles in between the doubles in a square grid pattern. For my second pillow design, I challenged myself to create a design that was truely different than anything I had done previously. I really wanted my design to 'jump off the page' so to speak. I spent some time creating different textures with my circles, folding and crunching them up in all kinds of ways to experiment with different options. I fell in love with a pattern created with three staggered circles folded in half. With three staggered circles stacked on top of each other, I folded the stack so that I could see the tops of all of the circles from the other side and popped a pin in them to hold them in place. Again, not knowing what the end design would look like, I went ahead and made as many three-circle folded stacks as my supplies would allow me to use throughout my design. This created the restraint shape that would guide my design process. I arranged my folded circles (along with solo left over circles) on my square pillow base in as many different ways as I could think of, taking pictures of my favourite options. After careful consideration of the ‘highlights reel’ I settled on a pattern with a strong central focal point created by the edge of my folded circles lining up directly through the centre of my pillow design and facing opposite directions on either side of that line. A strong central focal point created by the folded circle edges. To keep both of my designs in place after I had settled on a final design, I simply tacked them in place with straight pins to their pillow bases. This was a little more complicated with the folded circles because of the amount of fabric I needed to tack down but with a few more pins, no problem. I knew that I wanted to incorporate raw edge appliqué into this project but I wasn’t sure how visible I wanted the stitching to be. After a few experiments, I decided to use a thick grey thread for the stitching on both pillows (the visible and larger stitching was also a way to repeat a design element throughout both projects which would only add to the over all cohesiveness) and that raw edge appliqué was going to give me an added element of texture (which I was really looking for after so much needle turn appliqué over the last year). For my raw edge appliqué, I decided to use a cross between and blanket stitch and a satin stitch as this would secure my circles in place and add interest. Just to mix it up I stitched an X star over some solo circles for my green and purple pillow design. For my folded circle stacks, I only stitched every other half circle, not wanting the stitching to make my project look too busy. It is always good to take a step back during the stitching process, take a break, and have a fresh look at how things are progressing. I did this a few times during my project progression and noticed that my stitching was getting bigger as I worked. I was able to redo this stitching before I had gotten too far off track. After both of my pillow tops were finished, I took a moment to look them both over and make sure everything was where I wanted it and that I was pleased with my overall designs. And I was! I felt like all of my design goals had been met: to create an improv project that incorporated both circles (instead of the usual rectangles) and raw edge appliqué (instead of improv piecing) while looking cohesive overall (without an initial plan). I was able to use my 'No Rulers, No Rules' approach to improv quilting with circles and appliqué. Awesome! I decided to make these pillows envelope backed because it is an easy way to finish a pillow that doesn’t require any fuss with zippers. Next week I’ll share how I quilted my pillow tops and created a simple envelope back. There are a few ways to go about it and trust me, I’ve tried them all! I am convinced that I have discovered the fastest method and I’ll share that with you in part two of my IMPROV DESIGN CHALLENGE series. Sign up for the SMT Studio Journal mailing list to be notified when there are new Journal posts and to get access to all the free content in the SMT Creative Resources Library. Hey there! I’m Shelagh (pronounced Shay-la) and I’m the artist and founder over here at Stuart Moores Textiles. Stuart was my great grandpa and a pretty interesting guy. You can read more about us in the about section of the SMT website. To find out when there are new SMT Studio Journal posts, subscribe to our newsletter. If you want to see what I am working on today, you can find me on Instagram @stuartmoorestextiles. Happy creating!